CYP HDBaseT Splitter 2x8. 2x HDMI Input, 1x HDMI Output, 8x HDBaseT up to 100m Outputs with PoE/LAN. 4K2K Resolution & 3D Support. HDMI Input Selector. This 4K2K capable HDBaseT™ HDMI to HDMI and CAT5e/6/6A Transmitter supports the transmission of video (resolutions up to 1080p/4K2K) and multi-channel digital audio to eight remote HDBaseT CAT5e/6/6A outputs, plus an additional HDMI output which can be connected to a local HDMI display for monitoring. 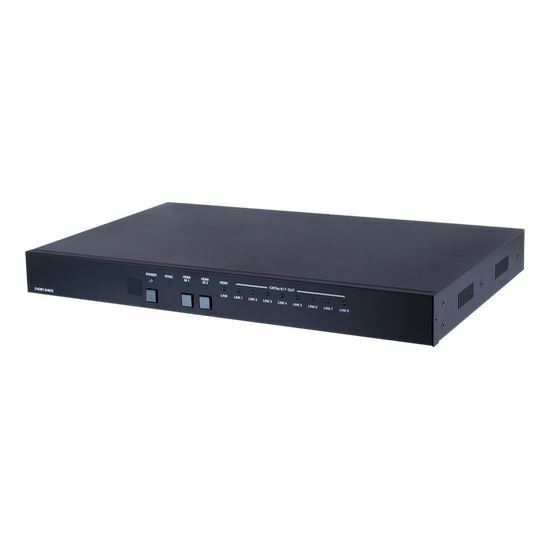 The HDBaseT outputs can be connected to compatible Receivers for distances up to 100m over a single CAT5e/6/6A cable (for each output) and can transmit High-definition Video and Audio, bi-directional IR control, RS232 pass-through, Power over Ethernet (PoE) that can power receivers and LAN serving that allows all connected devices to share a network. For additional flexibility, there is an Audio De-Embedding function which allows audio integration into a wider AV system or direct connection to an AV Receiver. Audio outputs are via a digital optical connection or an analogue stereo output (2 RCA).